We had our February penultimate winter club night in the Vickers suite at Brooklands and were lucky to have Jack Froelich as our speaker. He told us tales of his time as a young pilot flying C-7A Caribou planes during the Vietnam war. Great presentation. He struck a cord when he mentioned “droopy ailerons.” We are looking forward to our sell out 50th anniversary event at Brooklands on 6th April. On the 9th we will be going on our first ride a bike night (led by yours truly) from Downside car park, Cobham.KT11 3DQ. Leaving at 7pm. See you there. First let me thank Richard Huckle for 3 years of great work as Chairman, I shall be trying to fill his boots. As you read this the weather may be softening ( well there is always hope ) Saturday March 2nd see’s our last winter wandering, Starting from Newlands corner at 11am to Bocketts Farm. The 19th March will be our last winter club night at Brooklands, we are fortunate to have Tony Page as guest speaker. He rode a Vincent from San Francisco to the top of Alaska ! Don’t forget our golden anniversary event at the iconic Brooklands club house on April the 6th. Tickets available at meetings. Finally the Jim Allen run will now be on Sat 30th March ( to avoid a clash with the Ardingly show ) Jeremy Sigger will be leading to the Royal Armouries Museum at Fort Nelson for lunch and then back to Newlands Corner. This is my final section notes; by the time you receive this journal there will be a new chairman and scribe. I would like to take this opportunity to thank all members for their support and participation over the last three years of my chairmanship of the section. I hand over to a new chairman who will no doubt continue to develop and build on the involvement of the members. For February we have winter wandering on 2nd and another speaker is lined up for of club night on 19th, for full details of these go to our Facebook page and our web site and look out for email notices from our secretary. Tickets for our Golden anniversary event on 6th April at Brooklands museum can be obtained from a committee member at forthcoming events - hurry as there are only a few (subsidised) tickets left. 2019 is the year of the Brooklands section golden jubilee. It was 50 years ago, sometime during 1969 the section was formed. We are keen to hear from anyone who was at the inaugural meeting or who has knowledge of the exact date of that meeting. A celebration event is planned for Saturday 6th April to be held at the Brooklands Museum. This will be a ticket only event, subsidised from section funds for the first 50 who buy tickets. Full details and tickets can be obtained at forthcoming events and look out for further notices, here and in the usual places. For January we have winter wandering on 5th; as always, weather permitting. Our AGM is on the 15th. Any items of "any other business" or nominations to join the committee should be received by secretary@brooklands-vmcc.org.uk by 8th January. For December our winter wandering is on Saturday 8th, a change of date from some other listings. Our ever popular Prize quiz night is on 18th held in the members bar at Brooklands museum, where you also are able to pick up our calendar of events for 2019. To round off 2018 you can get away from the family and meet up for our Boxing Day gathering at William IV , Little London, Surrey, which is now under new management; the bar manager is a biker himself so we are assured of a good welcome. 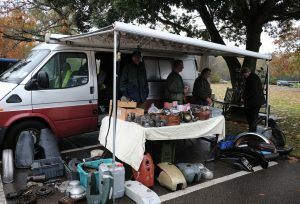 Our November autojumble raised over £450 for Section funds. Our first Winter Wandering of the season is on Saturday 3rd, departs Newlands Corner A25 near Guildford at 11:00. Fingers crossed for good weather. Our annual jumble and social is on Saturday 17th at Pirbright. Come along to have a rummage and a chat. To book a pitch contact chairman and see our ad elsewhere in this magazine. Club night on 20th at Brooklands museum, for a natter and another interesting speaker. 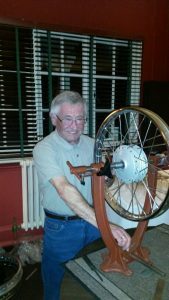 Pictured here is Roger Dunster demonstrating the dark art of wheel building at our September meeting. Our Pre-war and girder fork run is on 7th , this will start and finish at the same venue at Normandy near Guildford to allow for trailer and van use. More modern bikes will have a totally separate run. Refreshments will be available at the beginning and end of the run provided by the section. I am delighted to advise that on our club night on 16th at Brooklands museum we have speaking: Elspeth Beard who In 1982, at the age of just twenty-three set off on a 35,000-mile solo adventure around the world on her 1974 BMW R60/6. Hear her speak, buy her book, - there is even talk of a Hollywood film. Bookings are now being taken for our jumble 17th November , see our add elsewhere in the journal or contact chairman Richard Huckle for details. The last of this year’s social meetings at Pirbright is on 4th. Our ever popular Windsor run on the 9th - this is our annual foray along the banks of the Thames, Windsor great park and further into Berkshire. The first club night of the autumn season, at Brooklands museum is on the 18th. We are also on show again, this time at the Kempton Pumping station on 23rd. Looking further ahead into October, our Pre War and Girder fork run on 7th (October ) will start and finish at the same venue to facilitate van or trailer use, more modern bikes will have their own separate run on a different route. Full details on these activities are in the events listing, or on line. And into November, our jumble, again at Pirbright on Saturday 17th November, bookings for indoor or outdoor pitches are now being taken by the chairman. Some firsts and lasts this month. For the first time the section will be displaying at the Chertsey Agricultural show on 11th August. This will also feature a parade of the bikes in the main arena, so come along for a good day out, fingers crossed for good weather . We have a day run to the Tangmere Military Aviation Museum near Chichester on the 14th and finally (can you believe it) it will be our last evening ride a bike night of the Summer on 21st - over so soon! Full details are in all the usual places. Another full programme begins with the Brooklands Show on 1st, followed by our section BBQ on 3rd. Chairman will lead our summer run on 10th, this will be a full day out with a visit to the Royal Electrical and Mechanical Engineering Museum ( REME) in Wiltshire where a trustee of the museum is a personal friend of the chairman, so we are assured of a good welcome, total mileage will be about 130 miles. Finally, fingers crossed for our evening run on 17th : last year we almost drowned on this run ! Full details in the usual places. 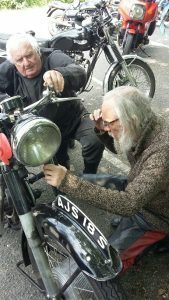 The Brooklands bike whisperer in action - again! 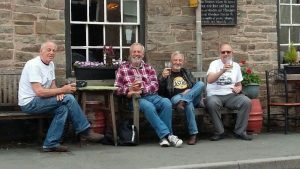 A busy month ahead : Social meeting on 5th , note this is at a new venue, we are taking a look at another bike night. This time we are at Pinewood Park bike night, between Wokingham and Bracknell. We will be on show for the first time as part of the Pirbright village fair on Saturday 16th. Ride a bike night on 19th and the Little Switzerland run on 26th. We will be on show again on 1st July at the Brooklands motorcycle show. All the details in the usual places. 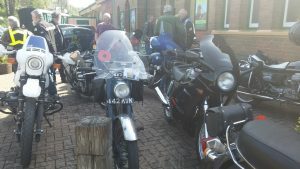 Our first social meeting of the summer season at Pirbright on Tuesday 1st, a fine evening will result in a wide selection of bikes making an outing. Our relay rally check point this year on 6th is a new venue with different route options, so do check the details before setting off. Dakar Special evening at Brooklands Museum for our final club night of the winter season. We have the first of our “ride a bike nights”, 10th April, each month has a different starting point, ride off at 19:30, check the usual places for details. Sunday 22nd April we have our premier run,” Jim Allen Run” 100+ miles, starting at Newlands corner at 10am. This year is a guided run using the drop off system, along some of the lesser-known lanes of Surrey and Hampshire in celebration of the outstanding runs of section stalwart Jim Allen. Mid-run tea/brunch stop then guided return to Newlands Corner. 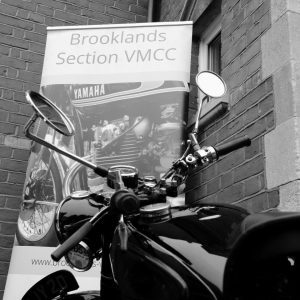 Register your interest at admin@brooklands-vmcc.org.uk and please disregard any previous notices on this event. Final winter wandering: Saturday 3rd March, Newlands corner 11am, to a new destination where the landlady is a biker herself and offering 10% off our food order. 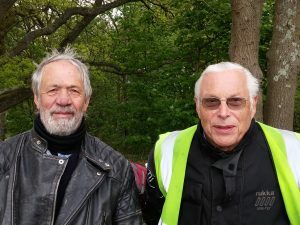 Our final club night of the winter season on 20th March at Brooklands museum is a “Paris Dakar” special; we have a former bike competitor and a backup driver who will provide insights into this unique motorcycling challenge. Final bookings are now being taken for the “Brooklands Breakout” our four day trip to Wales, 21st to 24th May, with three nights fully inclusive overnight accommodation, route guides, great food and some entertainment, it’s so good we're going back for the third year: contact treasurer@brooklands-vmcc.org for more information and to book. Winter wandering is back to Sunday for February only ( 4th), Newlands Corner 11am. Bookings are now being taken for the “Brooklands Breakout” our four day trip to Wales, 21st to 24th May, with three nights fully inclusive overnight accommodation, route guides, great food and some entertainment. It’s so good we're going back for the third year. Contact treasurer@brooklands-vmcc.org for more information and to book. Finally, club night at Brooklands museum on 20th February with another great speaker and a chance to meet up and plan your riding for when the weather gets better. Wishing all our members and supporters a safe, healthy and enjoyable year which begins, if it’s not too cold and wet, with winter wandering on 6th. . Note this is a Saturday. Meet Newlands Corner 11am, further details on the Events page. AGM time again on 16th at Brooklands museum. We are looking for new blood to join the committee and members who can assist with planning and leading runs. Contact chairman for more information. The last date for AOB agenda items is Jan 9th. The Section Dinner will be on 3rd February. For details and to order, contact the chairman or look for the link on the web site home page. Like many sections we operate the “second man drop off corner man” system on most of our runs. This process usually works well at ensuring no one gets left behind, however recently we have experienced the process not working to its optimum. This is usually due to participants new to the system not fully understanding their responsibilities as a corner man when it’s their turn, or being unclear who the tail end man is. We will be making an extra effort to brief the process at future runs and our tail end man will be wearing a blue tabard. December highlights, winter wandering, a short ride into the Kempton jumble on 2nd, our ever popular quiz night and results of photograph competition is on 19th. Want to get away from the family on Boxing Day? Join us for our social gathering. Full details are in the journal, or on line. 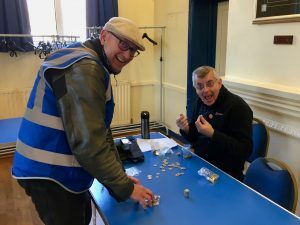 Our ever popular Jumble and social meeting takes place on Saturday 18th at Lord Pirbright Hall, Pirbright, Surrey, GU24 0JE. Clear you garage and workshop with an indoor or outdoor pitch. All pitches are to be booked in advance: contact chairman@brooklands-vmcc.org.uk . Looking for a bargain or that elusive missing part, or just a chat? Come along, there is ample hard standing bike parking, car parking and a refreshment van. Our first winter wandering is on 4th, note this is a Saturday. club night on 14th at Brooklands museum, see our web site, Facebook or journal listings for details. Another very active month for the section: our last social meeting of the summer, our first club night at Brooklands Museum, we're on show at the Kempton Pumping Station Classic Show, and it’s our Girder Fork Run : full details can be found in events section of this journal or on line. 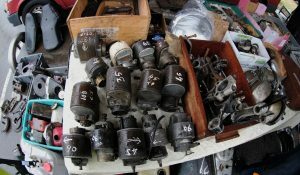 A future date for your diary is Saturday 18th November for our annual jumble and social meeting, full details coming in next month’s edition or contact chairman@brooklands-vmcc.org.uk for advance information or bookings. Girder fork run Sunday 10th September- not quite what we had in mind ! Tuesday 8th is the third of our weekday runs. Our Pinewood run will be more pleasurable, now avoiding Sunday traffic around Windsor as we ride through the Great Park and end at the shady Pinewood Park for lunch. Our final ride a bike night of this season is on 15th. Check out our photographic competition, it’s not too late to enter, see the Section's Facebook page for details. 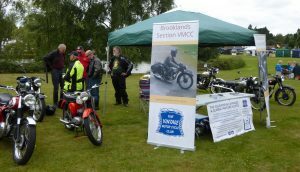 A busy programme this month with the Brooklands show on 2nd July where the section will have a stand, and the BBQ on 4th where all are welcome. Our summer run on 13th, is now a weekday run, an all day trip to the south coast with the option to visit the Sammy Miller Museum finishing with a ride back through the spectacular New Forest, The start is at 10am from Bushe Café on the A30. Ride a bike evening on 18th completes the schedule. For details of these activities go to our web site at www.brooklands-vmcc.org.uk , Facebook at www.facebook.com/brookvmcc or the events section in this journal or the VMCC web site. Thursday 29th June is the first of our series of day time weekday runs – “Little Switzerland Run”, starting at Jacks café on A30 at Bagshot, at 10am. A fifty mile ride to a new destination. Other daytime weekday runs will also take place in July and August. Throughout 2017 we are trialling new starting points and different days for our runs to gain experience, knowledge and feedback on what works best. For details of these and other section events go to the events section in this journal, the VMCC web site, our new section website at www.brooklands-vmcc.org.uk and Facebook. Getting stuck researching the route for our new weekday, daytime run on Thursday 29th June. Let's hope it's all clear on the day. Our new summer riding season begins with the first running of the Jim Allen challenge, which we intend to develop into our highlight run of the year; see the advert elsewhere in this edition and event listing for further information. Also our ”ride a bike nights” commence, whereby this year we are trying out new starting points. Please check for details before you set out, otherwise you might find yourself on your own. 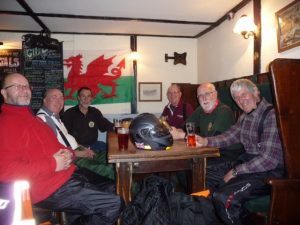 Final bookings are now being taken for our “Spring Break” four days riding to Wales, contact Neal Young on Neal.Young@brooklands-vmcc.org.uk to check availability and booking. The final events of our winter season schedule are : Winter Wandering, 5th and our last club night at Brooklands museum on 21st. From April we progress to a new programme of runs which will see new start points, dates, including Saturday and weekday events. Communication will be critical, to be kept informed directly, from the section and if you are not receiving mail currently, let me know your email address. I always like to include a photograph with these notes, please continue to share your pictures on Facebook and directly to me if you so which. 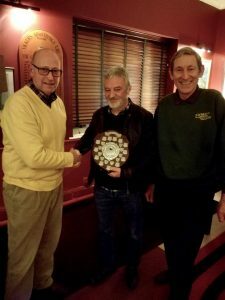 David Gibson ( centre) , receiving the Bruce trophy for an outstanding contribution to the section. David served on the committee for over 25 years. The photograph is of my trusty BMW out on a cold day researching routes for section runs. Runs are the heart of our activities and we are very grateful for those who organise and lead them. We are always looking for new ideas and members to have a go helping with researching, planning and leading runs. I would be pleased to hear from anyone who can offer their support and assistance to develop our runs to appeal to a wide section of member’s interests. Winter wandering on 5th after our dinner the previous night and club night on 21st. For 2017 we are making significant changes to our programme, starting in April with: new dates, new events, different start venues and moving away from all runs being on a Sunday, including some weekday and Saturday runs. Look out for detail of these on Facebook, this magazine, the web site and our emails. Our own section calendar will be available shortly. Winter wandering as usual Sunday 8th, our AGM and social meeting on 17th, , new committee members are needed, to discuss this and to obtain a booking form for our annual dinner on 4th February, contact myself.